Multi-gyms for home use are designed for private use. Semi-professional multi-gyms are designed for a longer operating life and can also be used at hotels, clubs, and for company's fitness. Multi-gyms of commercial quality are best for professional use at a gym and for a very long operating life. Semi-professional and professional multi-gyms are also excellent for home use due to their high-grade material quality. Choose your multi-gym according to the given floor space. Choose the muscle groups, which you prefer to train. Type and size of a weight block determines how high the maximum training resistance of multi-gym can be adjusted and how fine the load can be set. The Men's Health curl pult Power Tools can be used alone for exercising arms or as ideal upgrade of the BioForce multi-gym. The Men's Health curl pult Power Tools is perfect for biceps and triceps training, the SZ-barbell bar is already included in delivery. 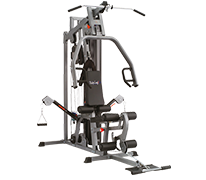 The equipment of a multi-gym is made of number of training moduls, weight block, and other accessory. Exercise a multitude of muscle groups of the whole body with a complete equipment; training comfort is higher for well-equipped multi-gyms. A sturdy construction with high thickness of frame gives the multi-gym stability. In addition, own weight, standing surface, and general workmanship are considered. A high stability makes the multi-gym more durable. This feature takes adjustment options of separate moduls to exercising persons (measurements, weight levels, etc.) and general ergonomics of the multi-gym into consideration. Adjusting contributes to a greater variability while exercising. Correct articulation angles optimize the course of motion and prevent bad postures as well. A great variety of exercises is achieved by number of exercising possibilities for different parts of the body. The quality of accomplishing the motion (caused by pulleys, storages, friction resistance, or similar) is taken into consideration.